Dr. Benton Tyler received his bachelor’s degree in mathematics from Delta State University. He received a Master of Science and a doctorate in mathematics from the University of Mississippi before joining the University of Montevallo faculty in 2005. Since coming to Montevallo, Dr. Tyler has been involved with a number of initiatives on campus. 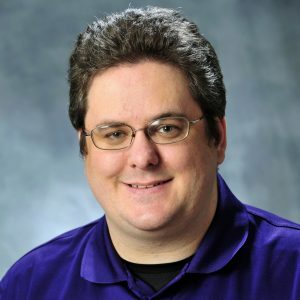 In addition to being the adviser of the student organization, the “Montevallo Organization of Gaming” (MOG), he assisted in developing the game studies and design (GSD) minor. He has also served as faculty senate president and won the 12th annual Life Raft Debate. Dr. Tyler has advised a number of senior seminars, primarily focused in the fields of graph theory, combinatorics, and game theory. He teaches a variety of courses, including calculus, mathematics for elementary school teachers, mathematics of games, graph theory, and statistics.